Constructed from a mix of brick, stone and render under tiled roofs to reflect the architecture of Calne, these new homes have been built to Hills’ exacting standards with modern methods and traditional materials. 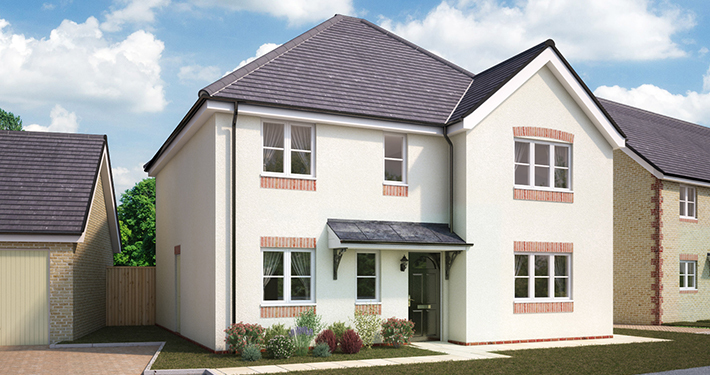 Information relating to the external finishes of individual properties will be available to view in the sales office. The heart of any home is a sociable kitchen with space for family and friends to meet, chat, cook, eat and entertain. These homes feature bespoke kitchens individually designed to maximise their space and layout and feature integrated appliances for a sleek, clean finish. The bathrooms are no less striking with contemporary white sanitary ware and stylish chrome taps and shower fittings, complemented by the latest floor and wall tiling from British Ceramics. Individually designed lighting and heating systems ensure the most economical and sustainable use of energy. These homes are full of the features you would expect with plentiful double sockets and downlights to kitchens, bathrooms and en-suites. High efficiency gas fired boilers provide central heating and hot water, supplying individually thermostatically controlled radiators to allow flexibility in the heating of your new home. Bathrooms and en-suites are fitted with heated chrome towel rails. Combined with the use of the best quality materials and systems available, these contribute towards providing economical, sustainable and efficient modern living. With Hills Homes, safety is paramount and the systems are enhanced by mains operated smoke detectors, carbon monoxide alarms and a heat detector in the kitchen too. External doors feature multipoint locking, while the front doors also include an eye viewer, letter plate and security chain. Your new Hills home will ensure a warm, safe, low energy, sustainable living space for you and your family, built with care and attention to provide the best of contemporary convenience with traditional character and excellent build quality.